When you ask five different people about the benefits of S/4 it is quite probable that you get at least six different answers. A finance guy will tell you about the joys of a soft close, a logistic guy will relate a lot to the codeployment possibilities of the Detailed Scheduling functionalities and if you find somebody wearing an undercut, he will surely fancy the power of experience data. While positively said, this shows the wide variety in which S/4HANA can do good to you and your enterprise, this is may be quite annoying when looking for that one elevator-pitch like benefit, because those points are all just a small part of what the digital core is all about. 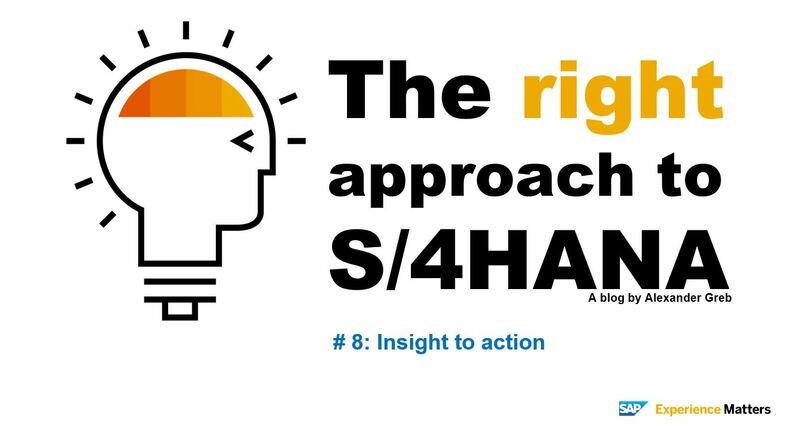 Ask me what is the all-encompassing benefit of S/4HANA in few words, it is in my opinion quite easy: Insight to action. Well, this may not sound so spectacular. Why did I choose this as the central benefit of S/4HANA that will guide you to become an Intelligent Enterprise? If you have taken a look at my former Blog posts, which as a interested, open, intelligent person you surely have (if not, I ain’t gonna tell anybody if you do it NOW), you will have noticed the structure of my thoughts, bringing you to this point in the discussion: When you have a forward, looking mindset and treat the digital core as a business topic (not as a IT topic) you will find yourself in a good starting pint to embrace the activities that will make you an “Intelligent Enterprise” that is not only in a great position to fight of any disruptive industry transformation, but is able to get out of this defensive situation and disrupt the industry itself. The central ability that is necessary to accomplish that is “Insight to action”. To get behind my point we want to divide above benefit into its to parts and start with “Insight”. A certain kind of insight itself is not really new of course. I remember myself, being a young business consultant in a high profile SCM consultancy company at the beginning of my career 15 years ago, providing a lot of insight to my customers by using a lot of data crunching in excel to tell the customer where to establish buffers at which amount in his supply chain based on this demands, orders and lead times. That’s already some insight. But why do I slash this activity? Were the results not correct? No, they were right, but only at that moment! By using static data, extracted from several systems, me and my fellow colleagues took a snapshot of reality that was then taken as a source for mid-term planning. But the situation of demands and orders, that lead to these recommendations could look completely different already one or two days later after the snapshot was taken. So the value of using a static data snapshot within a dynamic environment is quite limited, but that was and is in many cases still the state of the art. Already by relying on aggregates and precalculated KPIs in your database, you are working in a foggy environment that will definitely limit your ability not only to react to unforeseen events, but make it even difficult to realize them as that. In Blog Post #6, I explained the effects of the unified data model in S/4HANA that enables the “Single source of truth” and calculates KPIs on the fly by using not aggregates with undetermined timestamps but take actual line items. By this, the digital core enables you to see your KPIs “as they are”. Right now and precise. And this is just the baseline, the possibilities of Advanced Analytics give you even more benefits, but we will discuss that in a later post. “ … into action” is not possible if you have a break between your analytics system and your transactional system. Whenever you are forced to leave your analytical basis you loose context and orientation. Furthermore, any automation, decision support or AI is unable to give you a hand since you have a media break between these to disciplines and your transactional support isn’t able to connect. So, insight without action is no real help, or to be more precise: Insight always has to have consequences in the routine operations that are guided and managed automatically by your enterprise management system. This guarantees that you not only get aware of critical situations, but you are able to counteract in the best effective way, or, in a less critical situation, are able to fulfill your goals and KPIs with a maximum of precision and efficiency. Insight always has to have consequences in the routine operations that are guided and managed automatically by your enterprise management system. The unification of OLAP and OLTP into one system during the SuiteonHANA-era was just the beginning at an applicational basis. With the unified data model of S/4HANA we have now opened the door to new possibilities by joining these elements with the FIORI GUI technology and advanced automation and AI to establish real decision support that does not only accelerate processes, but also is able to give a completely new quality to its results. All hierarchy levels are profiting from these new possibilities. Not only C-Level is able to use the Insight-to-action possibilities by its digital boardroom, but also the operative levels, who can use these decision support abilities to lift their work to a whole new level. See for example the MRP cockpit. This little tool has huge consequences for the way you work. While former MRPs are black box runs that run through the night, set your planning straight and presented you bad news in the morning with the exception list, you are then left alone in solving these problems. And further worse: You see the success of your effort earliest the next morning when the next MRP had its run. If you need the solution quickly, you are already too late. The MRP cockpit gives you the choice to solve these problems much more effective. 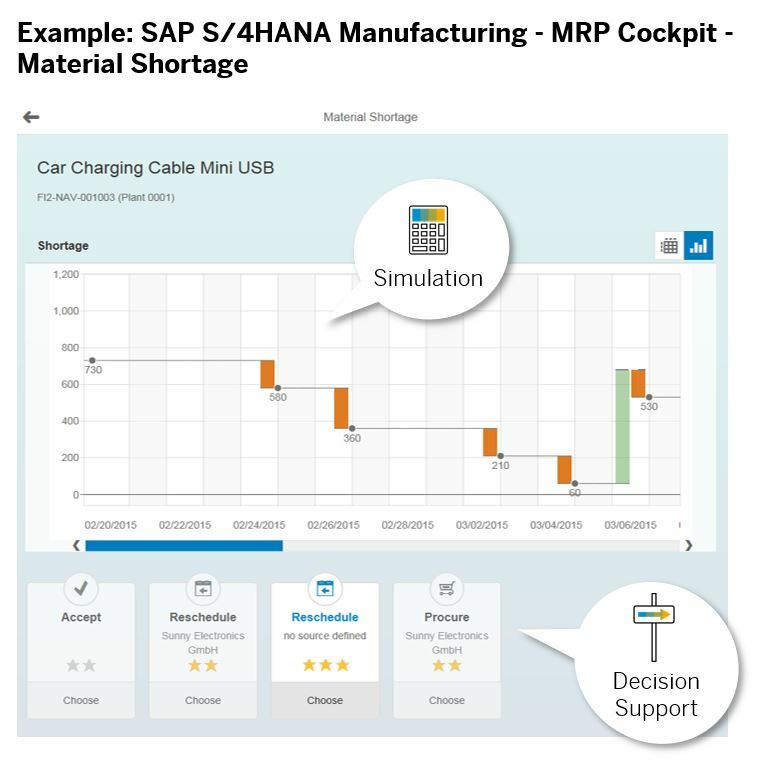 The exception lists issues are recognized by S/4HANA’s advanced capabilities and the MRP cockpit generates solution scenarios for each issue evaluated by the support of isolated small ultra-fast MRP runs. These evaluations (three-star solution, two-star solutions and so on) tell you which the preferable options are according to the available data. In consequence, you do not have to search for solutions yourself, but can take a look into the options the system generated for you and via a click on “Choose”, all necessary tasks are done to put your preferred option into action. In real time. These small examples are just a cutout of the vast possibilities that the digital core of S/4HANA gives you to put “insight-into-action”, it is true decision support at its best and a consumable innovation that lifts your level of excellence to a new height.